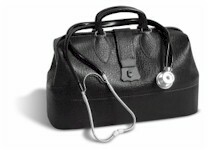 Good old Dr. Norman came to our house late one night when I was about 6 (1962) with the bag as pictured, gave me a shot, reassured my mother, and called my salesman dad at his motel in some town somewhere and talked to him about it...turned out my future wife was his patient too when we compared notes years later ... that dear Dr. took his own life and I was crushed. Still am. When I was about 3, there was a fire in Arthur Godfrey's TV studio, and they left the cameras running. I was so excited... I was bouncing on the couch and cracked my head open on the corner of an end table. The doctor came to the apartment and stitched me up on the kitchen table. Then they got too big for their britches and stopped making house calls. They got so expensive that health insurance was needed to pay their bills and the rest is history.